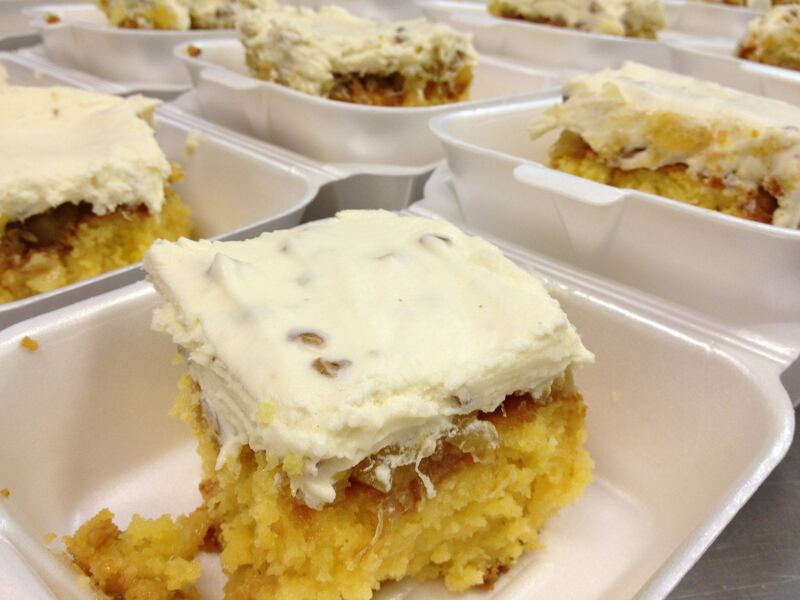 » Elvis Presley Cake – one of our most POPULAR Cake Specials EVER! It all started in 2011 when I was on the hunt for a Peanut Butter pie recipe to add to our regular menu of desserts. I researched TONS of recipes online, asked for input from customers and finally found an amazing recipe that fit right into our line up of made from scratch pudding pies which includes Chocolate, Coconut, & Lemon Meringue, Banana Pudding and Pecan Pie. 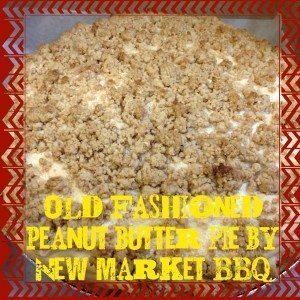 I found this “Old Fashioned Peanut Butter Pie” recipe on Christy Jordan's website SouthernPlate.com and I was hooked! What does all this have to do with our Elvis Presley Cake you say? Well, my husband Kelly suggested I add a cake to our dessert menu, so I dropped right over to my friend Christy's website and started hunting around for something yummy, and what caught my eye FIRST was the Butterfinger Cake Recipe. I'm a TOTAL SUCKER for a Butterfinger candybar or ANYTHING Butterfinger, so that is the recipe I started with. Then I introduced the Strawberry Cake Recipe to our menu and boy did we find a HUGE hit with our customers. This started me on a hunt for something new to do each week, so I found several to choose from on Christy's site and several from around the web. 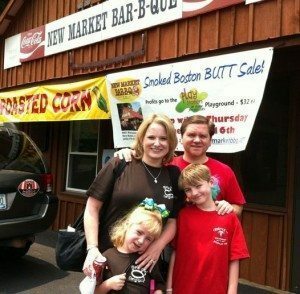 THEN, one weekend, Christy and her family popped in to pay us a visit at New Market BBQ! It was a great surprise as I'd been chatting with her online for months but had not meet her in person yet. Christy & Ricky Jordan along with their kids stopped in to eat lunch with us. During an awesome conversation with Christy during her visit, I was telling her how I was rotating cakes each week and she asked me if I'd tried the Elvis Presley Cake recipe yet and at the time I had not. It was to be the very next one we would try based on her recommendation and OMG, you guys have turned out to LOVE this cake more than any other I believe. It runs a NECK and NECK 2nd behind Strawberry Cake if it's not first. I'm so grateful that Christy ventured out to eat with us that weekend for several reasons. 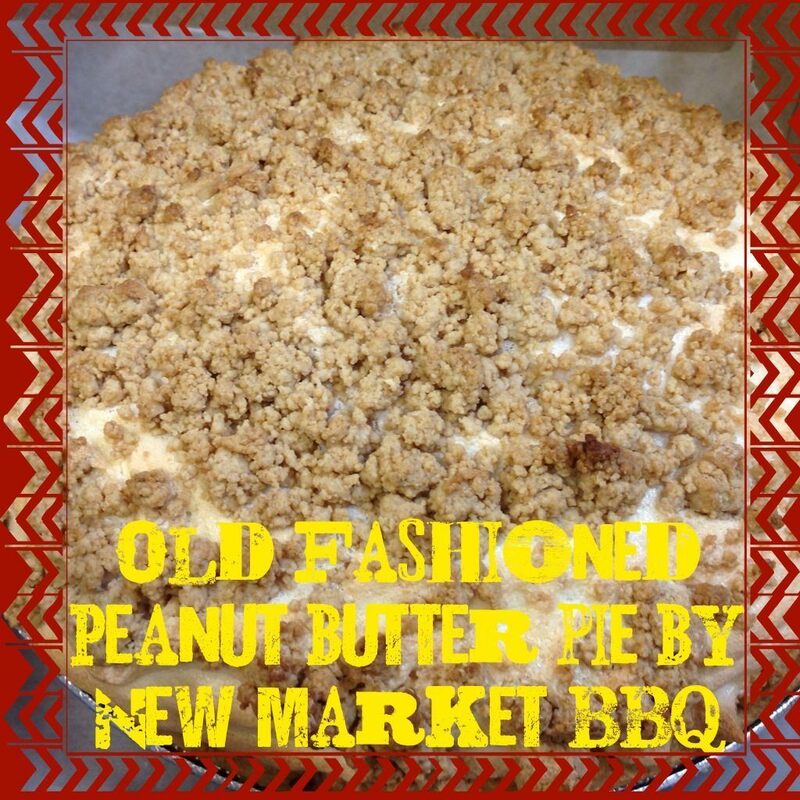 A great friendship has been created, several of Christy's readers are now regulars at New Market BBQ because she has shared about us on her Southern Plate Fanpage and blog, and a new fantastic recipe has found it's way onto our Cake Special rotation which makes for HAPPY CUSTOMERS. GRATEFUL is the word!! In researching to write this blog post for you guys, I am just blown away at how fast time has flown by. I did not realize that it'd been 3 years already since we added the weekly Cake Special to our menu. It was also another suggestion by Kelly that we start GIVING AWAY one of our Cakes every week, so y'all be sure to THANK KELLY for that next time you see him! LOL! This is Kellly with his serious face on!! We've now given away in excess of 100 cakes since starting our Weekly Cake Giveaway. FUN FUN!! If you haven't entered yet, go here to ENTER OUR GIVEAWAY be sure to look for our weekly posts on our fanpage regarding that week's special. Then if you don't mind, SHARE it to also help us spread the word. We are always GRATEFUL for your support! It's with your weekly help of liking, commenting, and sharing of our posts that helps us continue to grow. Now that we've started blogging, if you could SHARE the blog posts, that would be very helpful as well. 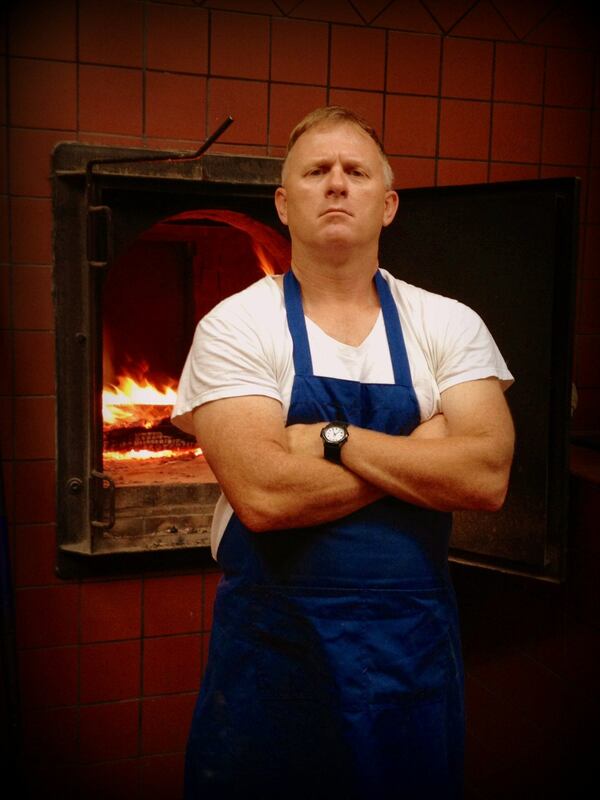 We hope you enjoy reading the posts and we look forward to serving your family again real soon. Scroll down to SEE our Recipe and to SAVE it to your Recipe Box. Now for the New Market BBQ version of the Elvis Presley Cake. We modified the recipe after making it a few times. I must admit that this modification came from a MISTAKE when I made this cake for the second time. I didn't READ the recipe THRU before MAKING it. I realized my mistake only after I had the cake in the oven baking and thought this is gonna be a disaster and had to run to the store for additional ingredients. Low and behold, it turned out SUPER!! So the mistake I made became now the version we make cause I think it's a little extra special good now. I did however go back and make the original recipe a couple times, but you guys LOVE the version with my mistake incorporated, so I decided to stick with it. It is a little more costly this way but you try it both ways and see which you love best. Original Recipe Inspiration from Christy Jordan's Southern Plate or our New Market BBQ version below. Either way, they are both fantastic! Be sure to SAVE this recipe to your recipe box, so you can shop for the ingredients on your next visit to the grocery store. Hope you enjoy this one! It's really a pretty simple recipe to make, so don't let the look of a lot of steps deter you from making it. I just like to spell it out step by step for you. Add drained small can of crushed pineapple to cake mix and blend. Pour into prepared pan and Bake in preheated oven for 25-30 minutes. While cake is cooling, boil pineapple and sugar on top of stove until sugar has melted. While cake is still hot, punch holes in cake with a fork and pour hot pineapple sauce over cake. Frosting is thick, so drop out evenly over cake so you can more easily spread it. Since the pineapple sauce is on top of the cake, it will want to move around, so be sure to get the frosting dropped out all over the cake best you can before you start moving it around to smooth it out so the pineapple won't show thru the frosting. One important lesson I learned about baking when I made this cake for the first time is to READ your instructions ALL THE WAY thru BEFORE starting. Sometimes these mistakes can lead to something great though! LOL!! I accidentally dumped the WHOLE can of pineapple into my cake mix when I made this the first time instead of holding it out to make the topping and pour on TOP of the cake after baking. Turned out it was really AWESOME IN the Cake as well as ON TOP of the Cake too! I cut back the amount of pineapple and drained it so it's not so moist. Turns out just GREAT! Hope you enjoy it! Enjoy, and remember to click SHARE above this blog post and to enter our weekly contest.